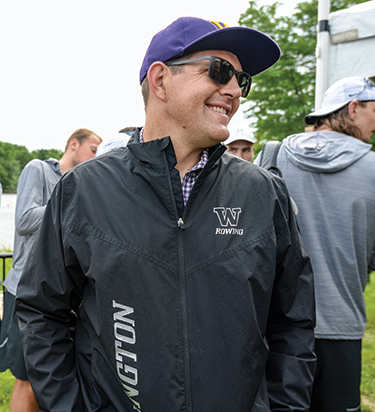 Michael Callahan rowed for UW from 1992-96, competed in the ’04 Olympics and has coached the men’s crew team since 2007, leading the varsity eight to six national titles. 1. What’s it like being a coach? The people I coach are much better oarsmen than I was. I’m astounded at how tough and mentally driven they are. One of the things I loved about rowing is whenever I put more work into it, I got faster. I love that direct relationship. That’s what I love about coaching. The harder we work, the better we develop these guys and the better they get. 2. The famous shell is always on display. The nine men who rowed that boat were from Washington. It sets an incredible standard for us. Some of our students can create a legacy that’s just as strong as the 1936 guys. That sounds really crazy but I think it’s true. 3. More than 70 UW rowers in the Olympics? That shows you what a standard we have. It also becomes very daunting to live up to. You realize that a lot of people before you and after you will do the same thing. It’s an incredible representation of the legacy of this program. 4. Talk about the UW-Cal rivalry. It is the backbone. It’s really important to have a rival. Oxford-Cambridge. Ohio State-Michigan. The Seahawks and 49ers. Some people think of those things as bitter but I think of them as something that made us really good. 5. Must be tough rowing in the winter rain. I think it makes us strong, mentally and emotionally. I think it’s the core of our program. We all know it’s nasty here so let’s go out and row in it.